March 27, 2011 - Jeppesen and Dynon Avionics, a leading supplier of avionics for the light sport and experimental aircraft markets, have entered into an agreement to provide Jeppesen NavData and obstacle services for the Dynon Avionics SkyView. The avionics data offering for Dynon Avionics serves as part of a total Jeppesen light sport and experimental aircraft solution suite for both certified and non-certified aircraft. ?Jeppesen NavData displayed through Dynon Avionics systems provides light sport and experimental pilots with the top worldwide flight information and navigation data available,? said Robert Hamilton, director of Sales and Marketing, Dynon Avionics. ?This agreement with Jeppesen provides Dynon Avionics glass cockpit aviators with the most accurate and complete navigation data anywhere that pilots fly.? Jeppesen NavData, obstacles, terrain, and charting solutions are available for third party integrations supporting a wide variety of applications and hardware solutions, including those within light sport and experimental aircraft avionics systems. Data updates are completed easily and conveniently using Jeppesen Services Update Manager software. ?Jeppesen provides industry-leading data and charting solutions. We are very proud to be the first choice of innovators and aviation enthusiasts associated with the light sport and experimental aircraft industry,? said Scott Reagan, director, Jeppesen OEM Client Management. ?Jeppesen?s world-class NavData information, integrated with Dynon Avionics? SkyView system, serves this dynamic segment of the aviation community and ensures delivery of the highest quality flight information available for aircraft owners and operators.? 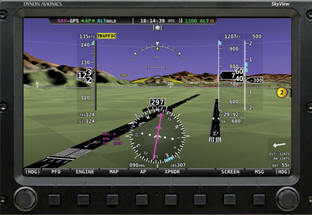 Jeppesen NavData and obstacle services are available for the Dynon Avionics SkyView D700 and D1000 systems. Coverage areas include Contiguous USA, East-Central USA, West-Central USA, North America, South America, Europe, Africa, Eurasia, the Middle East, the Pacific region, and worldwide.